Imagine that. I really like this redesign. It makes sense and looks amazing! Loving the color scheme. I bet this redesign will be compared a lot to the Batgirl redesign. But that is not a bad thing! Because we really need more redesigns of female superhero costumes! 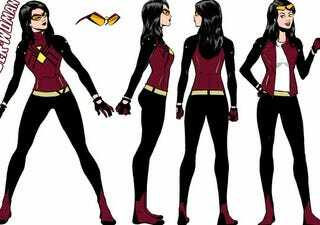 Now just lets hope Greg Land leaves Spider-Woman before this redesign hits the shelfs.